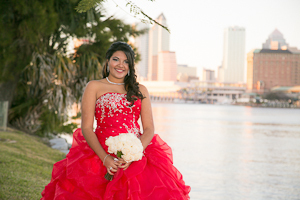 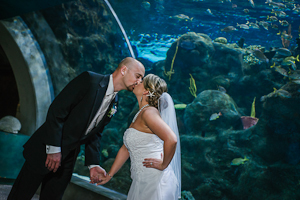 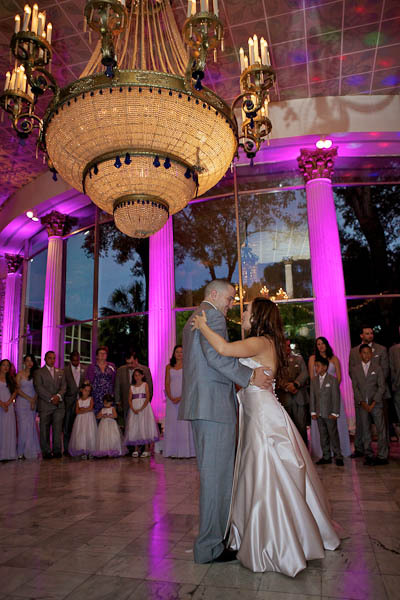 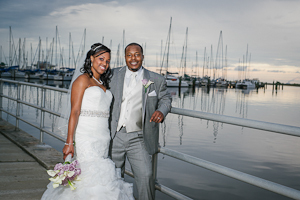 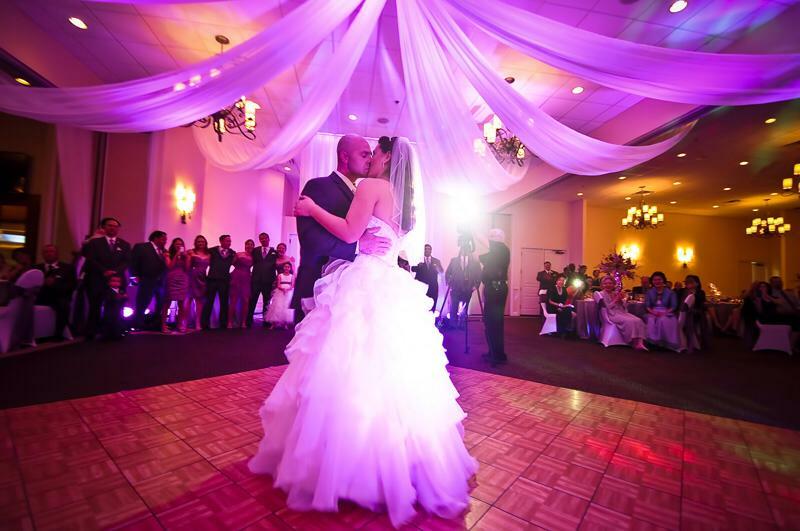 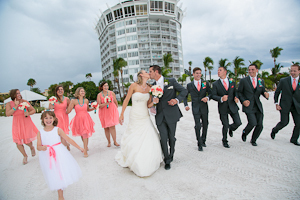 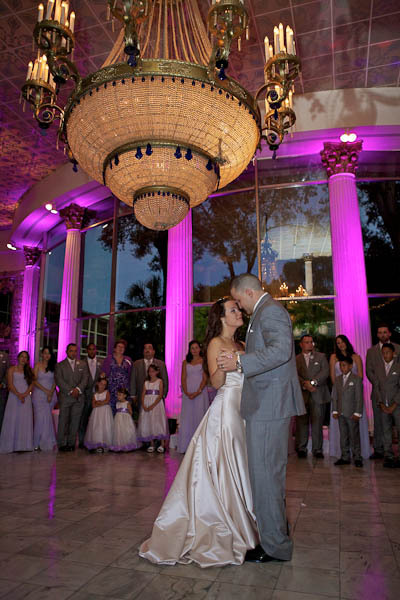 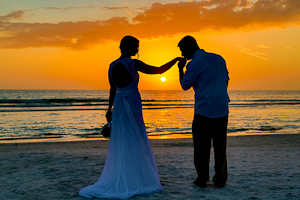 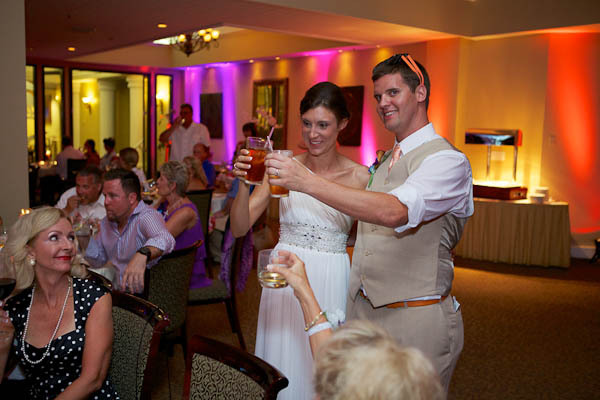 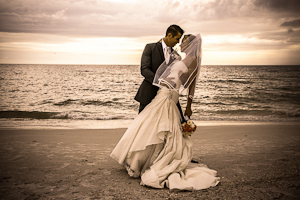 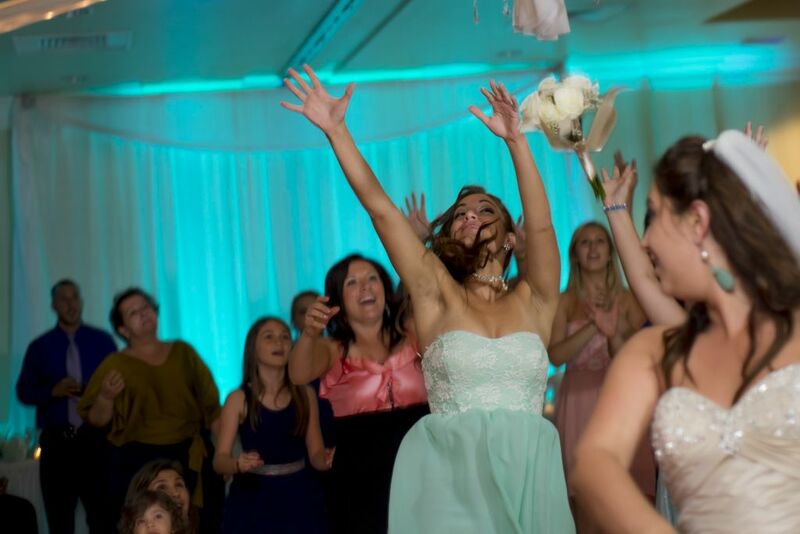 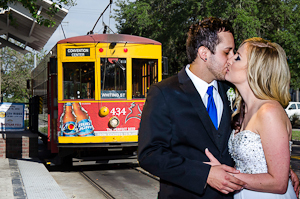 Wedding Lighting in Tampa Uplighting and Projection Monogram Lighting : Celebrations of Tampa Bay | Wedding Photographers, Videographers and more! 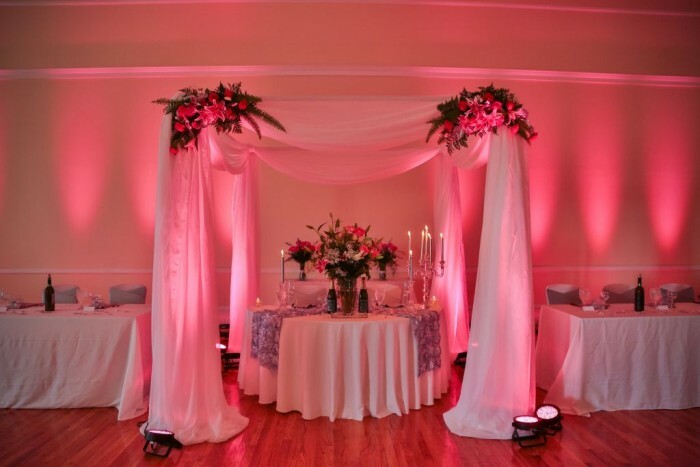 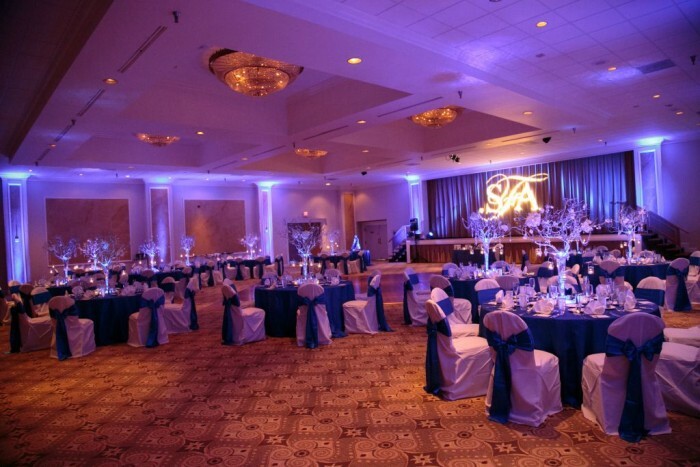 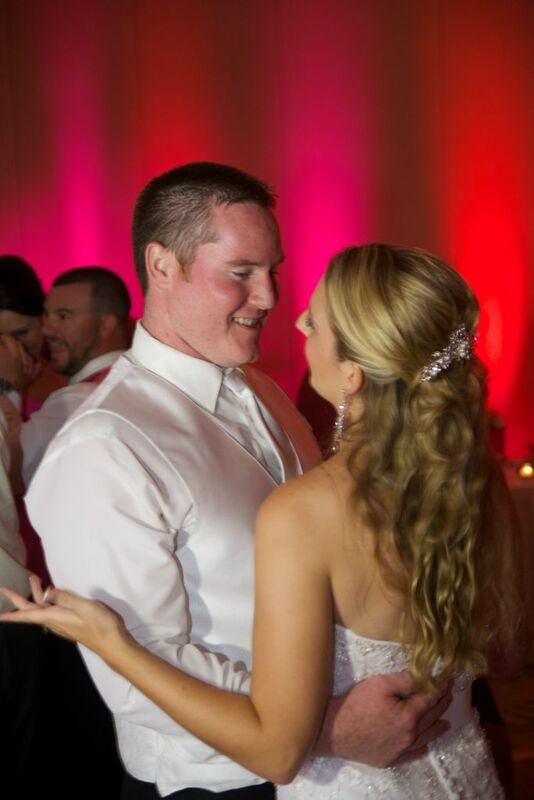 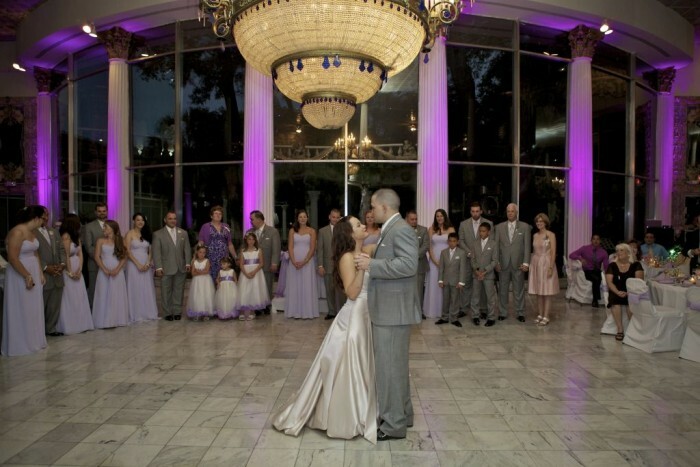 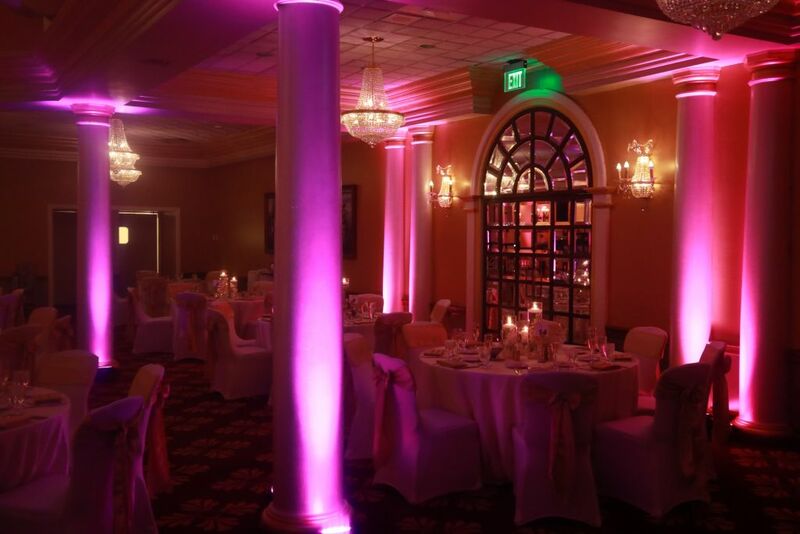 Create a Romantic and Magical background with our decorative wedding lighting in Tampa using Uplighting and Projection Lighting with monograms. 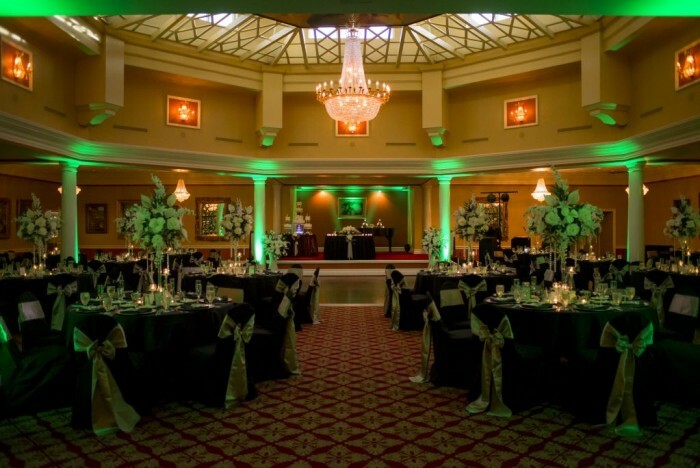 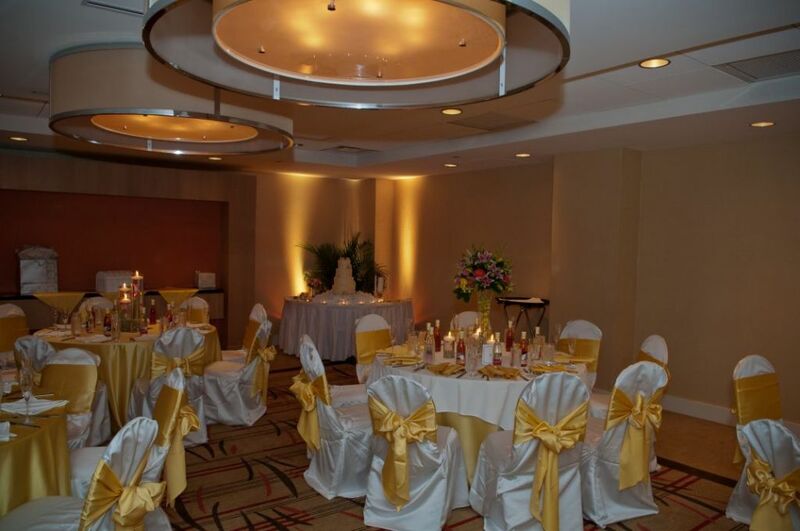 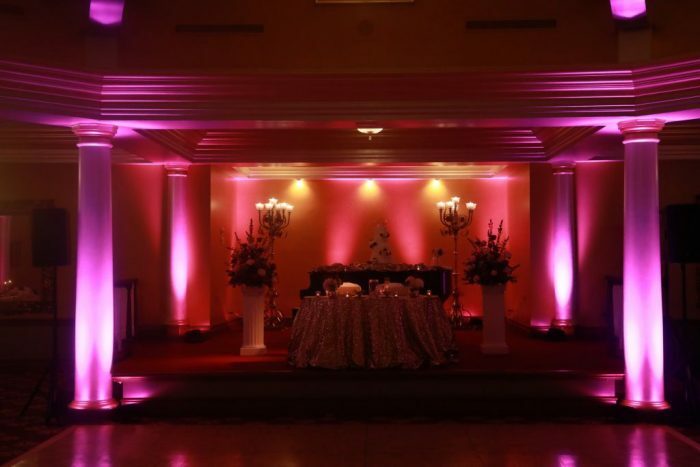 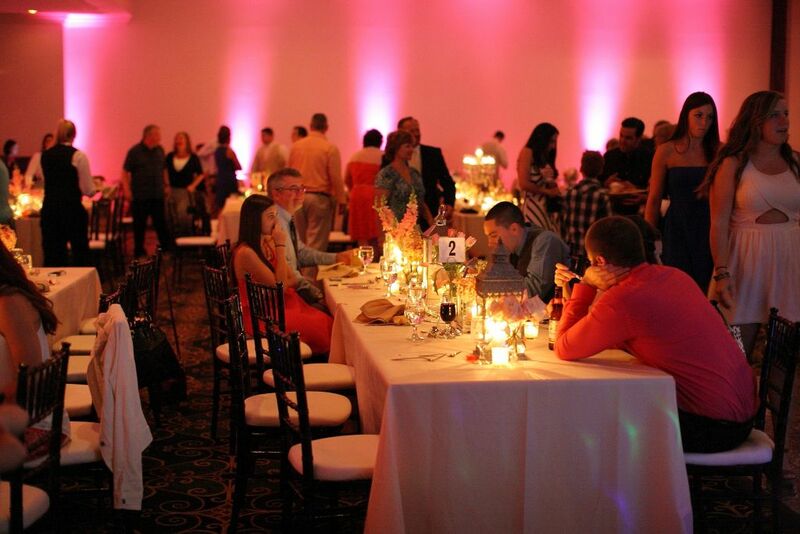 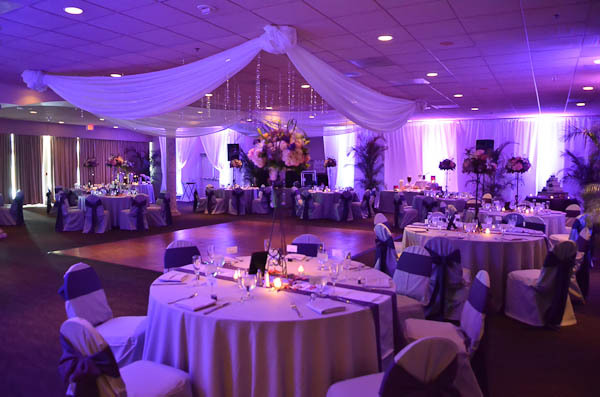 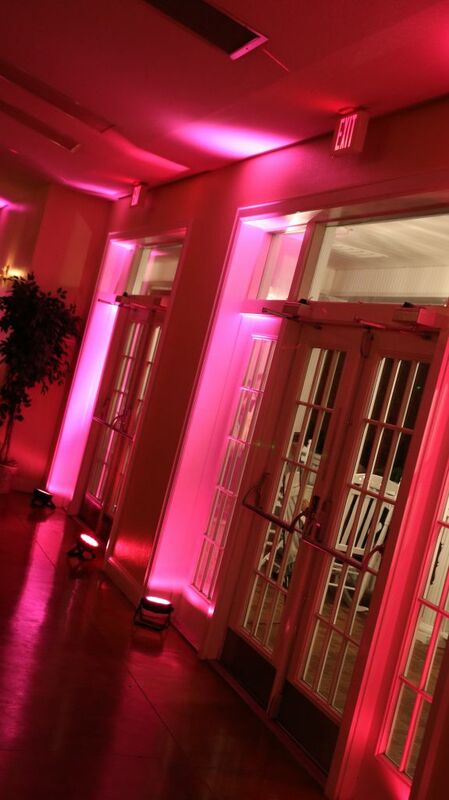 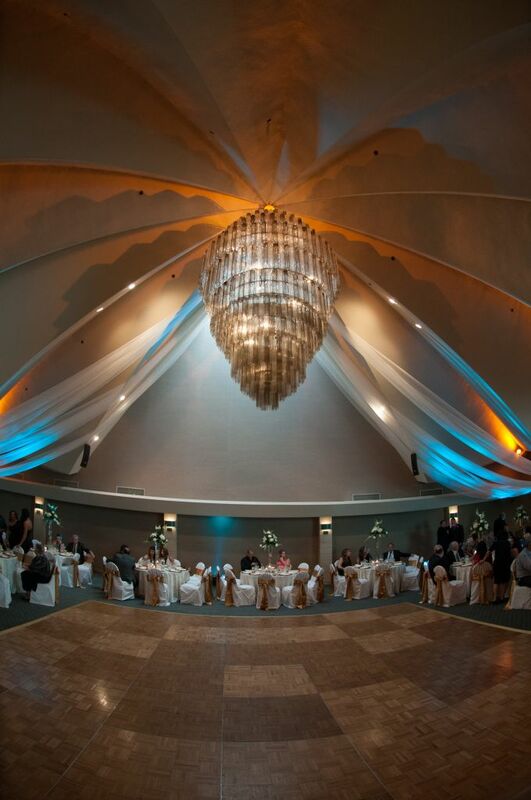 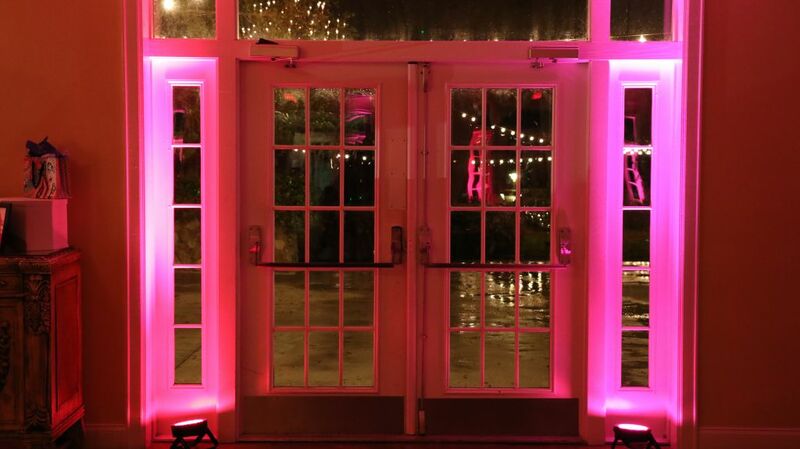 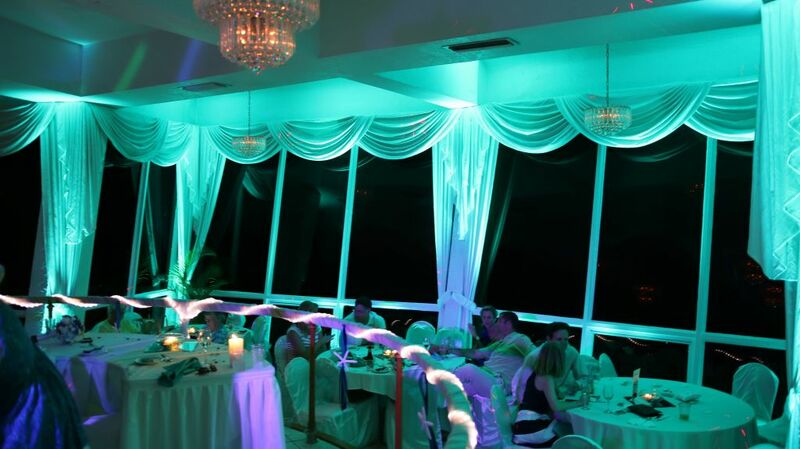 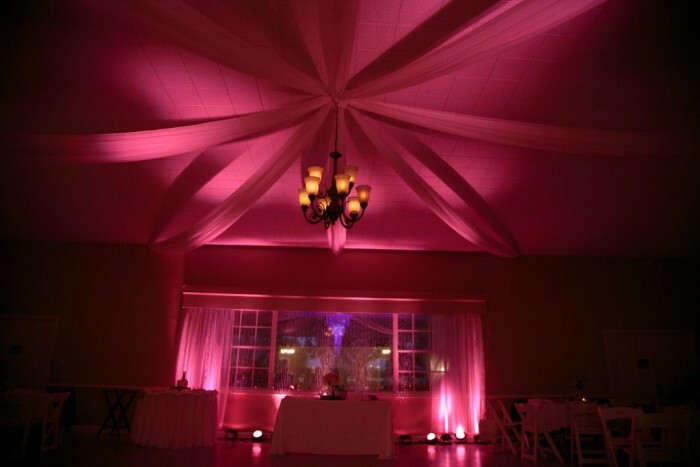 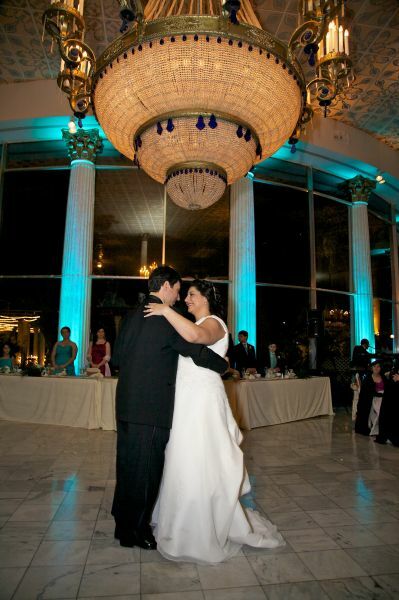 Select our Uplighting to the color or colors of your choice. 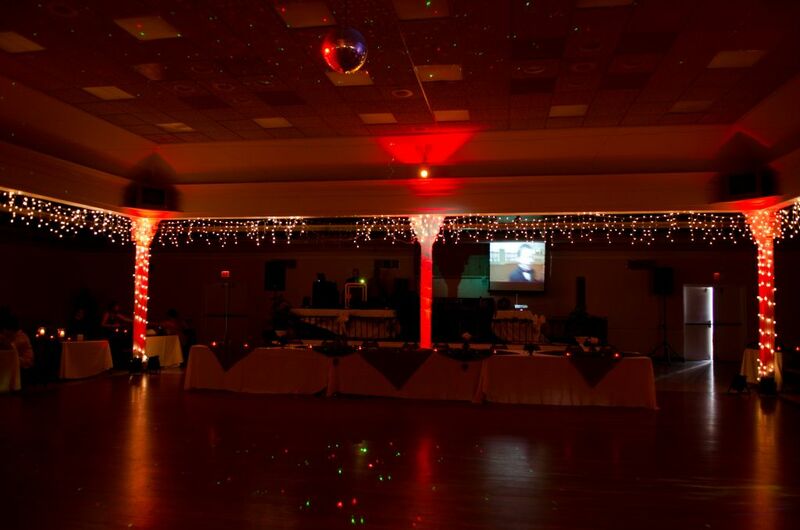 We also have Projection Lighting. 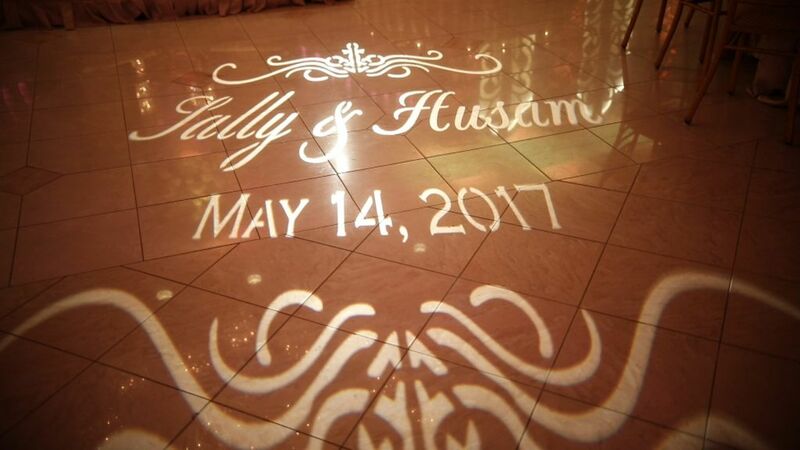 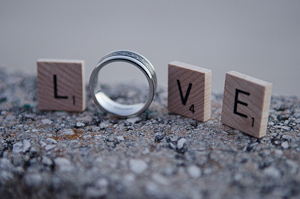 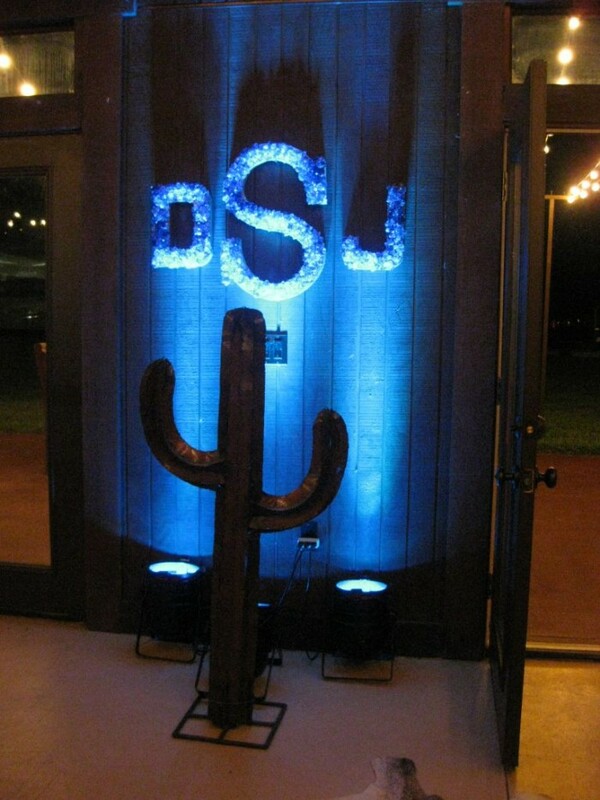 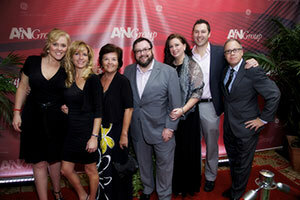 which can be personalized with a gobo of your choice showing your names, date, or logo. 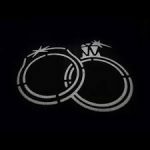 A “gobo” is a circular template that is inserted into the projection light. 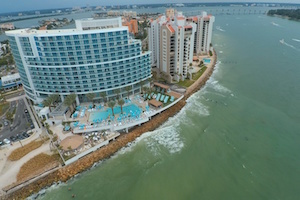 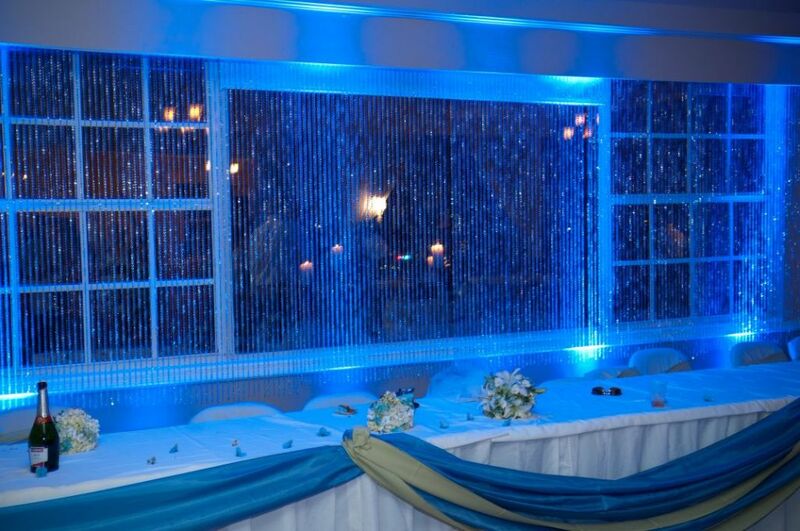 See our rates below. 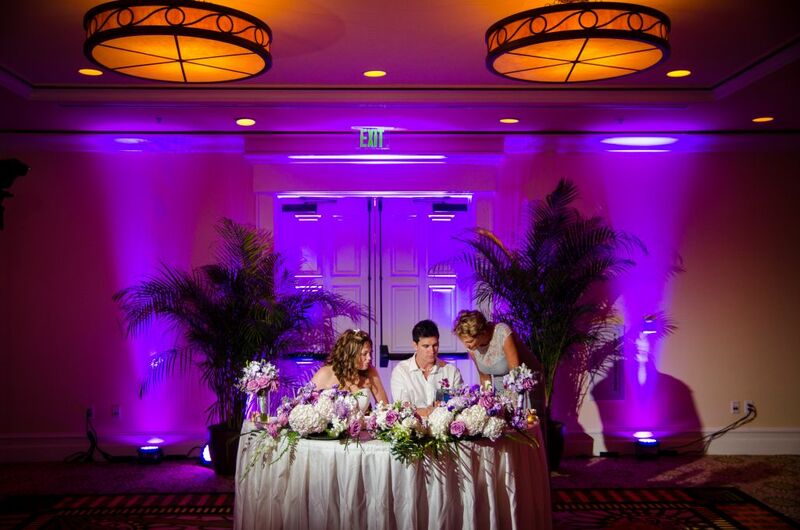 1)We use mostly cordless lights so there are no restrictions on where we can place the wedding lighting. 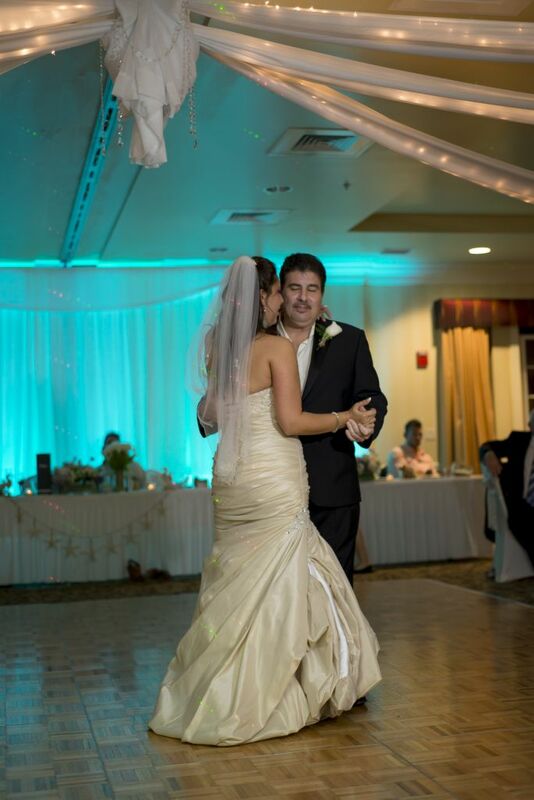 There are no messy wires. 2) Our large inventory of lights. 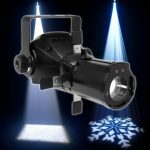 With over 100 uplights and a variety of both static and moving projection lights, we have the resources that a smaller lighting or DJ company does not have. 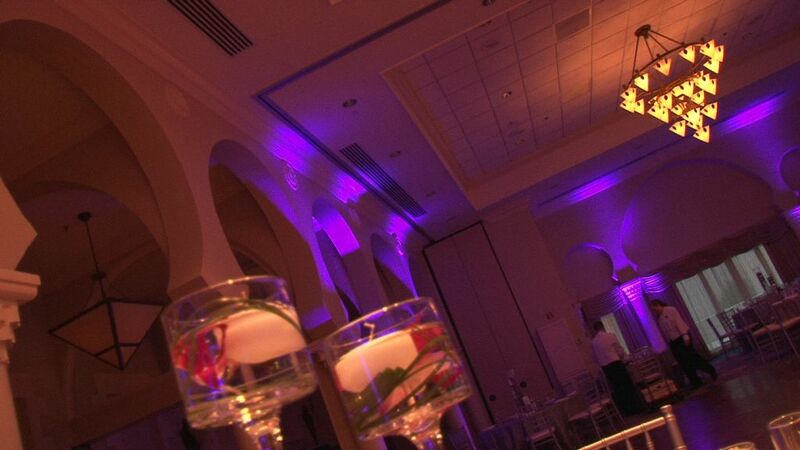 We incorporate 2 different varieties of up lights as well as both static and moving projection lights. 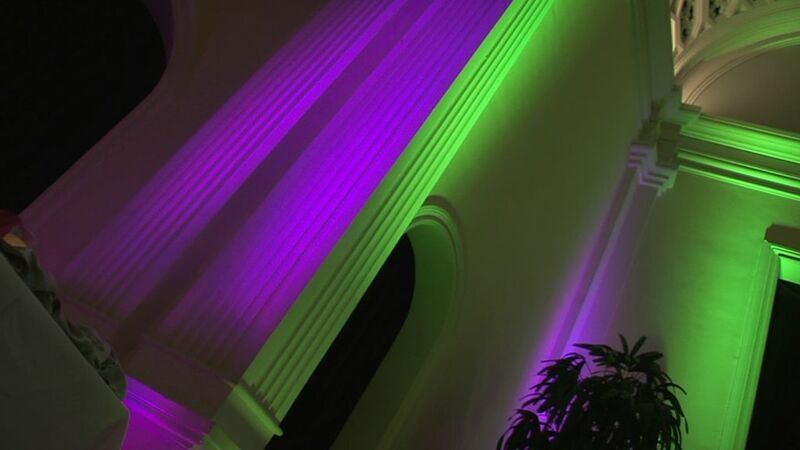 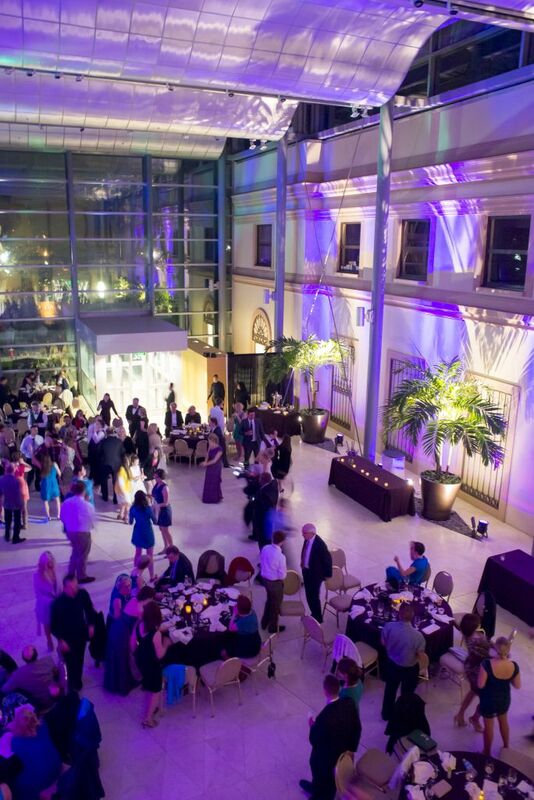 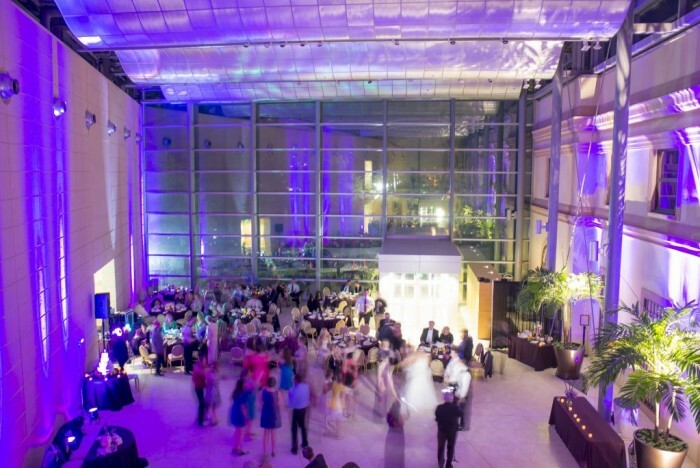 We use both the elegant cordless slim par 56 uplights (which take up less space) and the powerful par 64 theatrical uplights which are great for venues with high ceilings like the Museum of Fine Arts in St Petersburg. If you want to light up tall pillars like you see here at the Kapok Tree (in the picture to the left), it requires the more powerful par 64 lights. 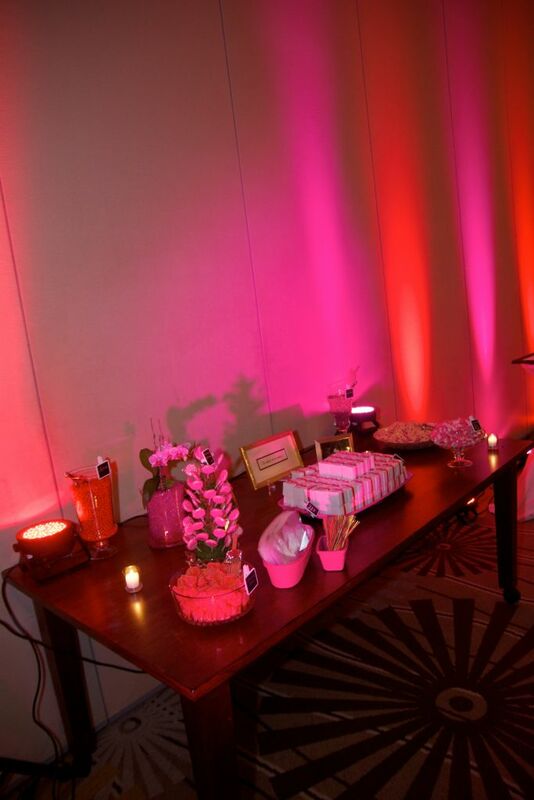 3) We take care of all set up and take down so that you can focus on other things. 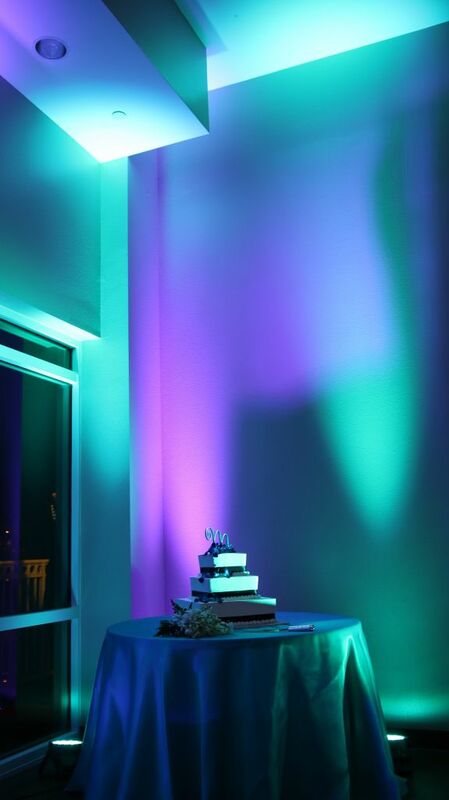 You can set our decorative lights to up to one color or multiple colors of your choice. 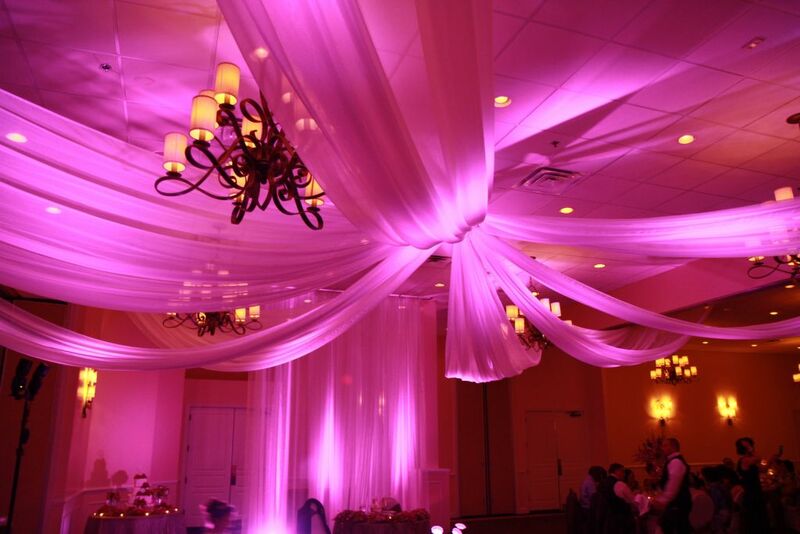 (999 Colors available). With our Projection Lights you can choose the pattern of your choice. 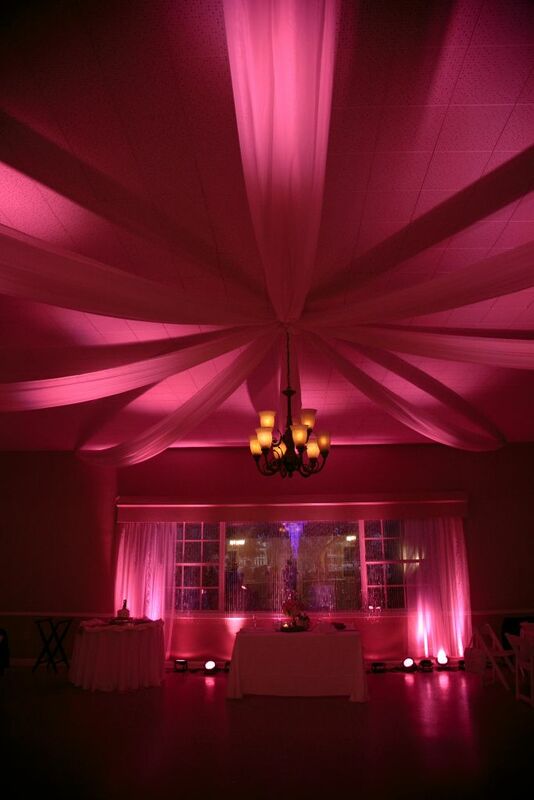 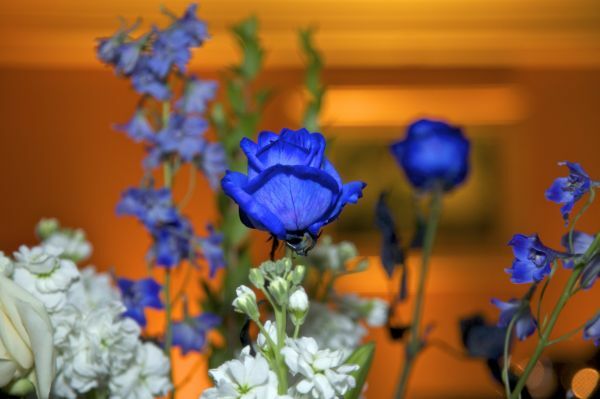 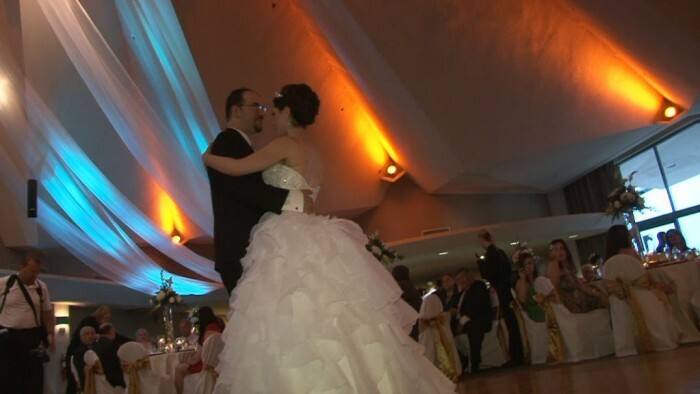 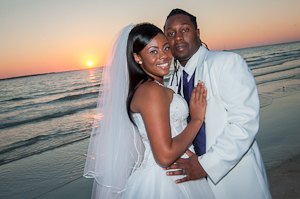 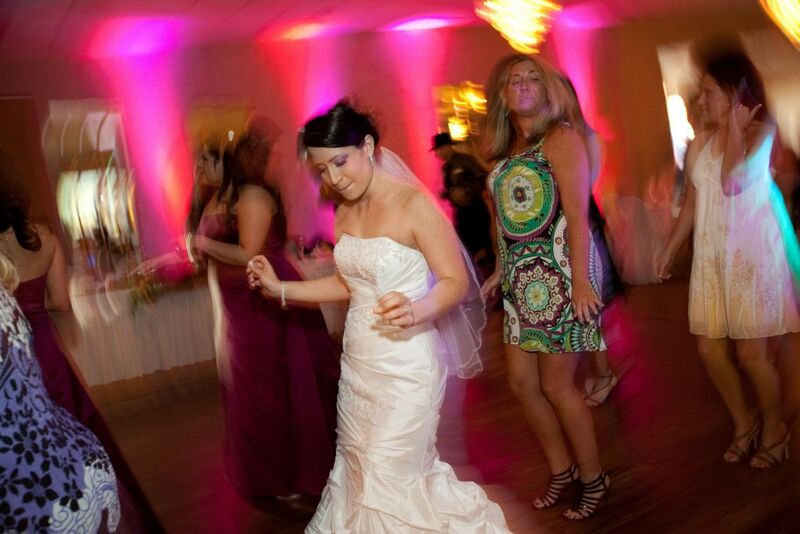 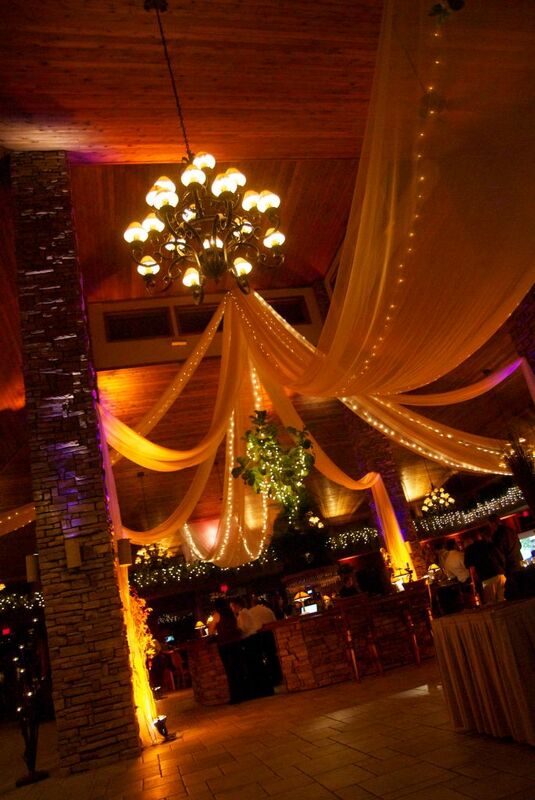 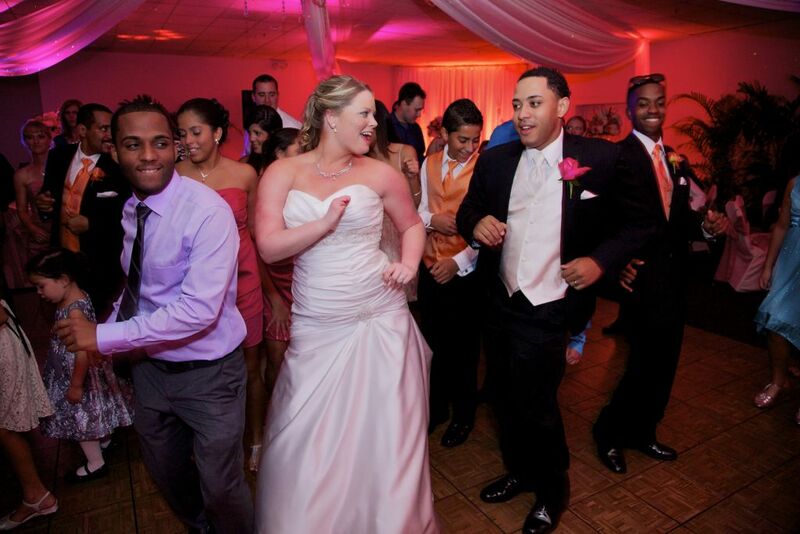 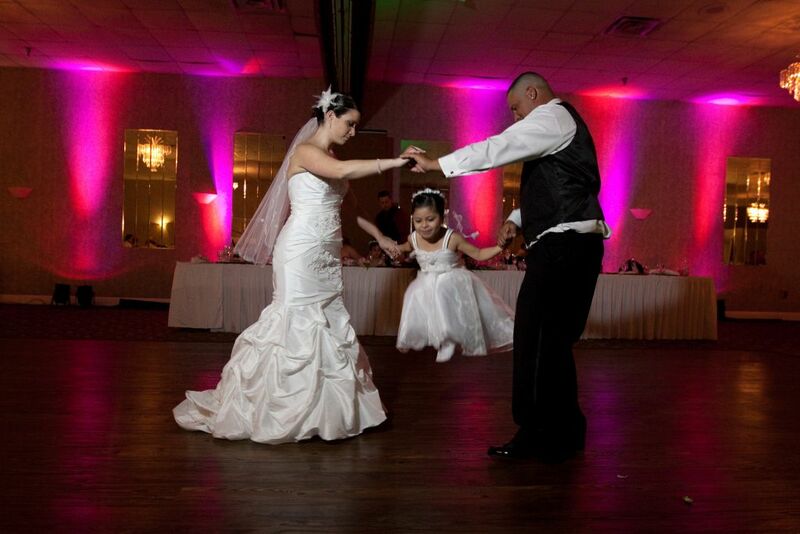 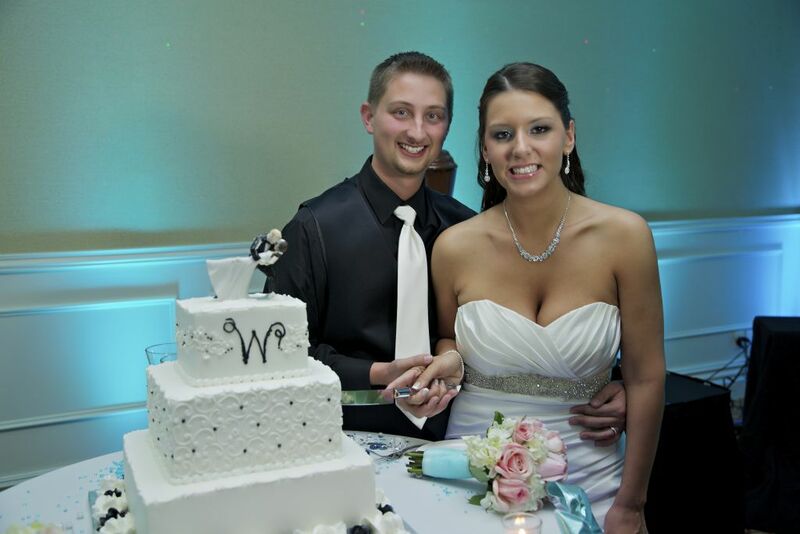 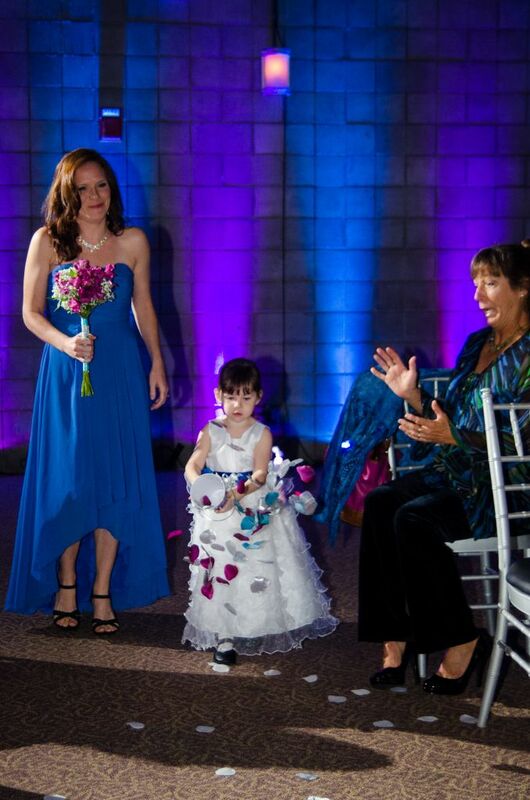 We reccomend you email us a sample of the colors of your wedding which we will match with our lighting. 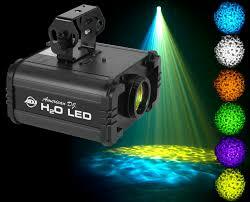 We use the very efficient LED lights, alhtough very powerful, use very little electricity. 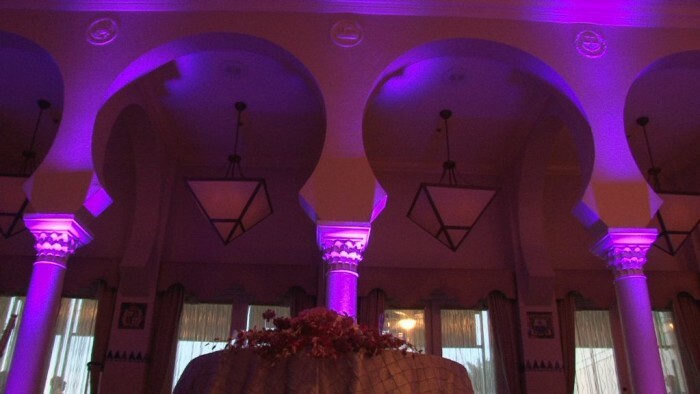 About 75 uplights is equivalent to the power used by a typical blow dryer. 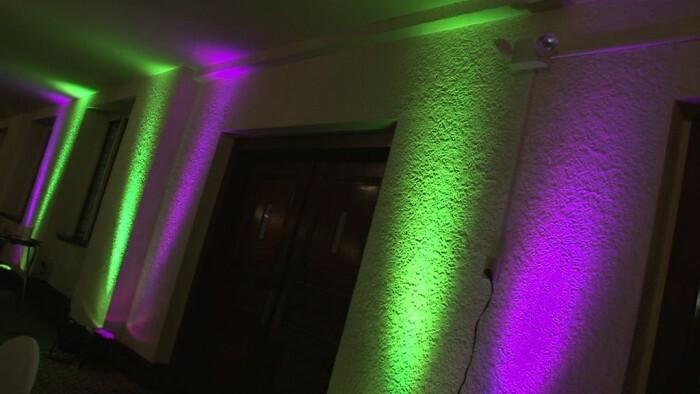 We can control our lights individually so therefore we do not have to use wires to connect them all together, which allow us not to have to run messy wires from light to light. 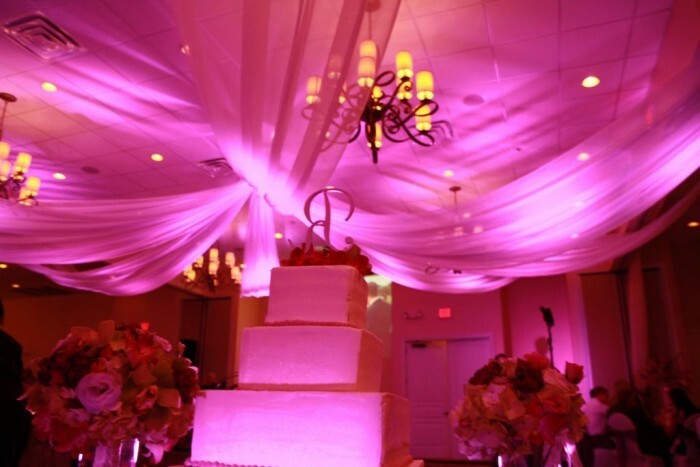 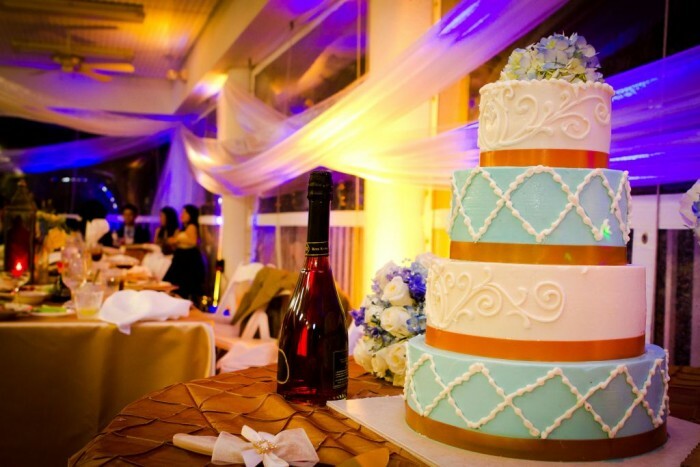 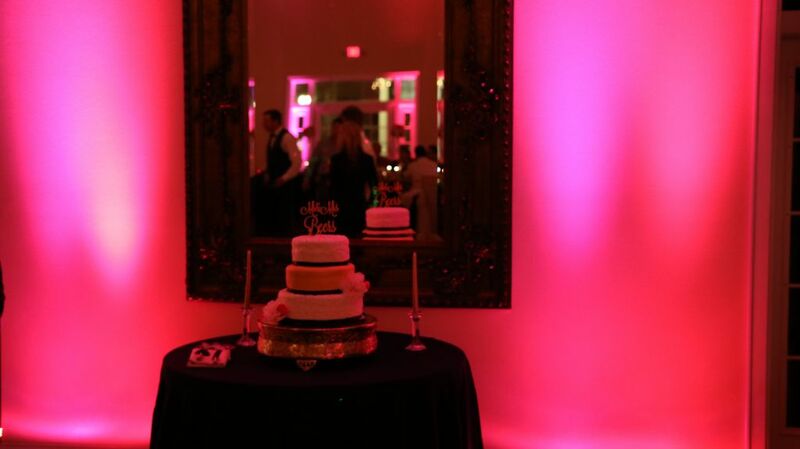 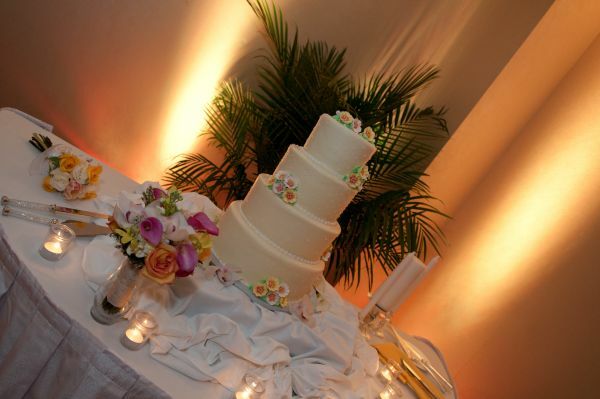 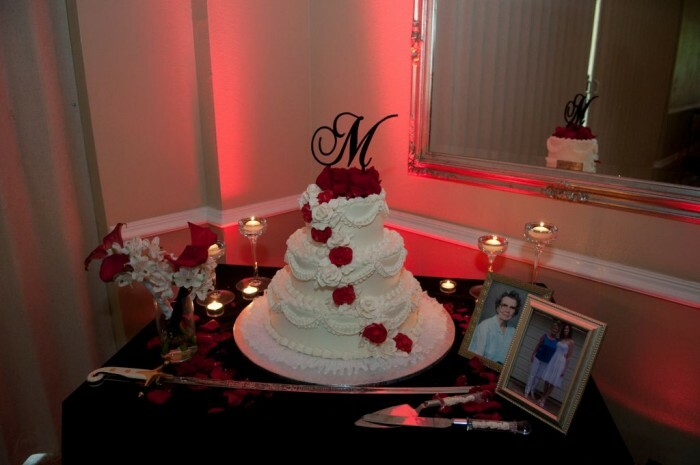 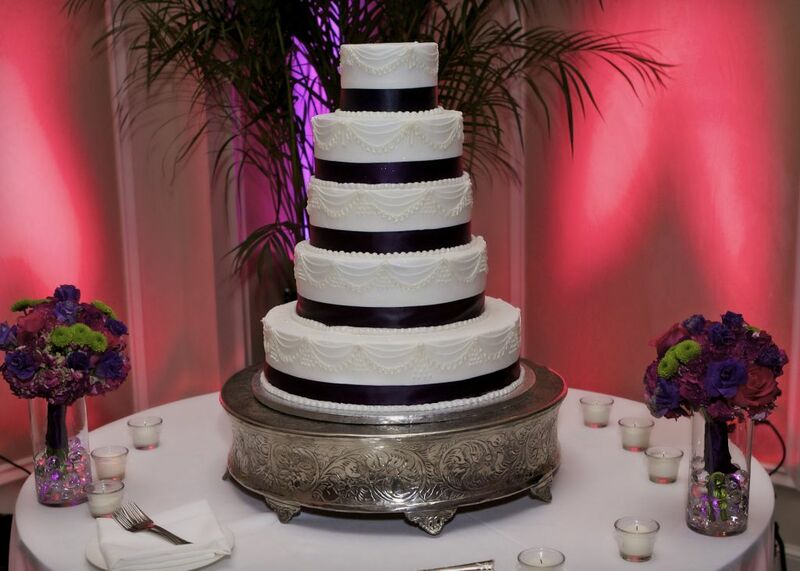 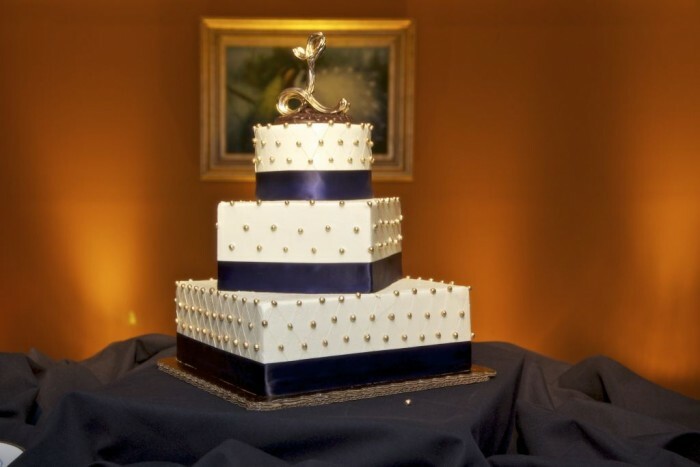 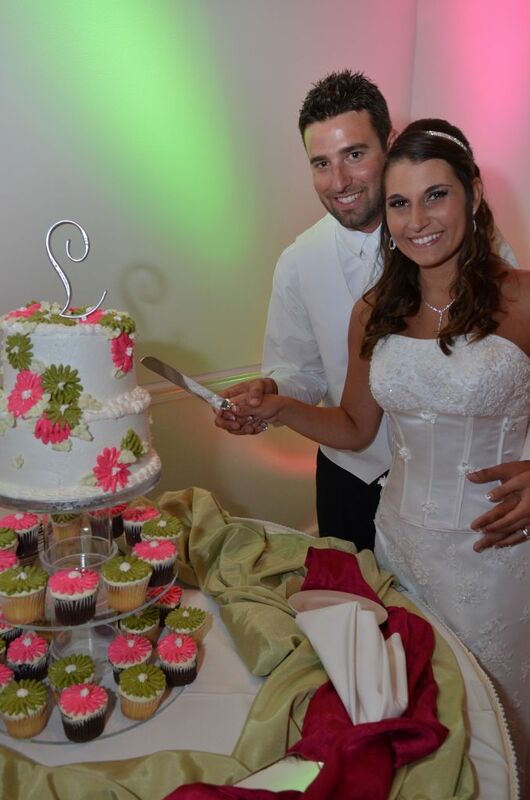 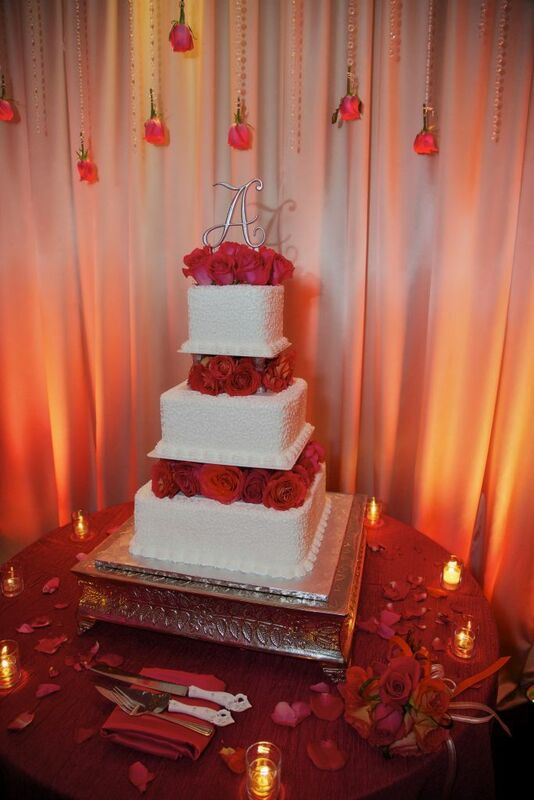 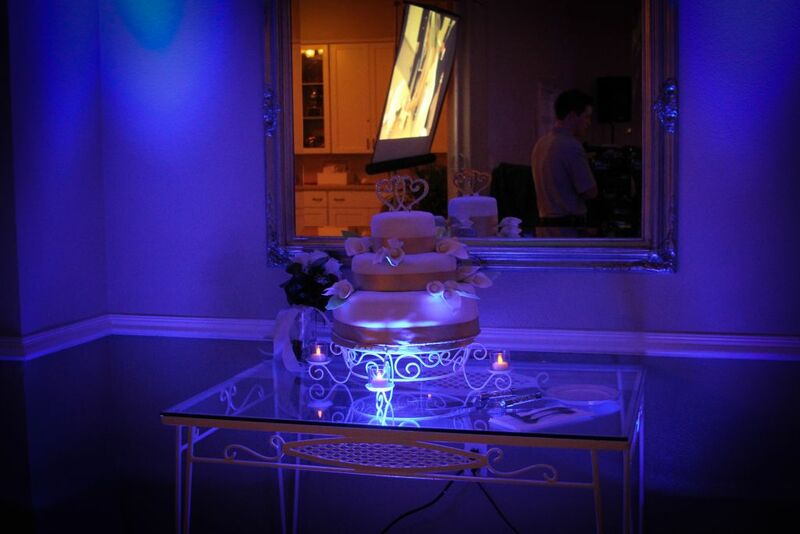 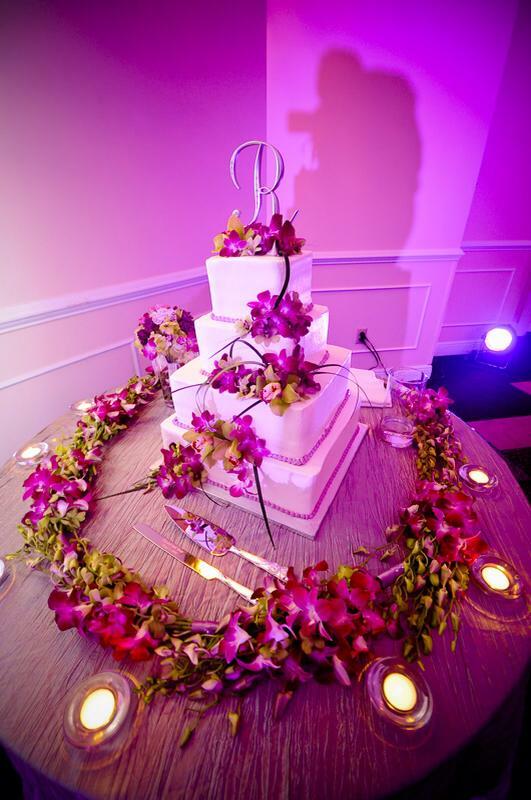 Highlight the Cake Table by placing a light underneath to create a glow underneath. 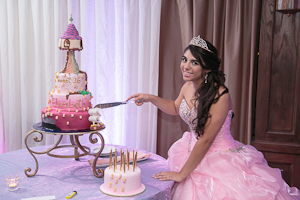 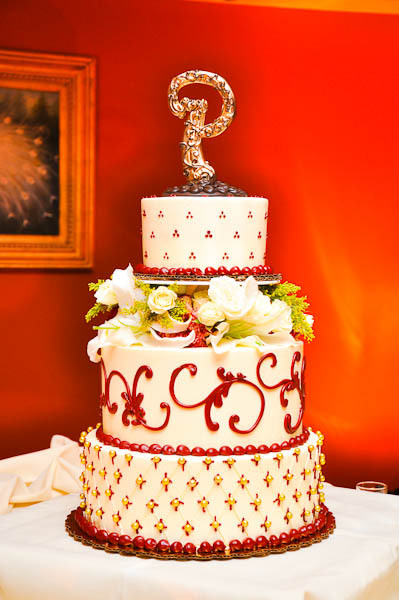 Position to light up pillars, statues, window frames, or on the cake itself, etc. 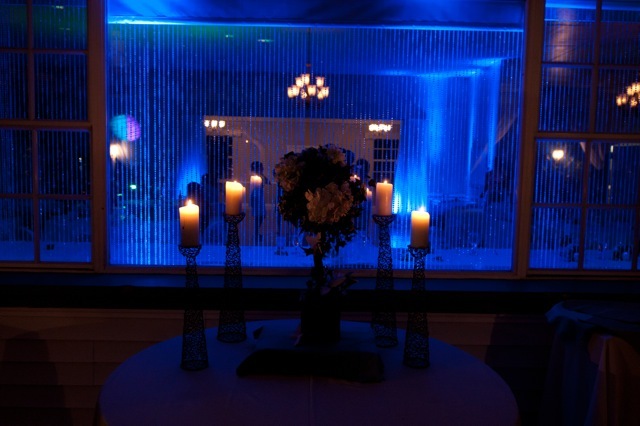 Lights can be used on a back patio for Cocktail Hour, or at front entrance for guests entering. 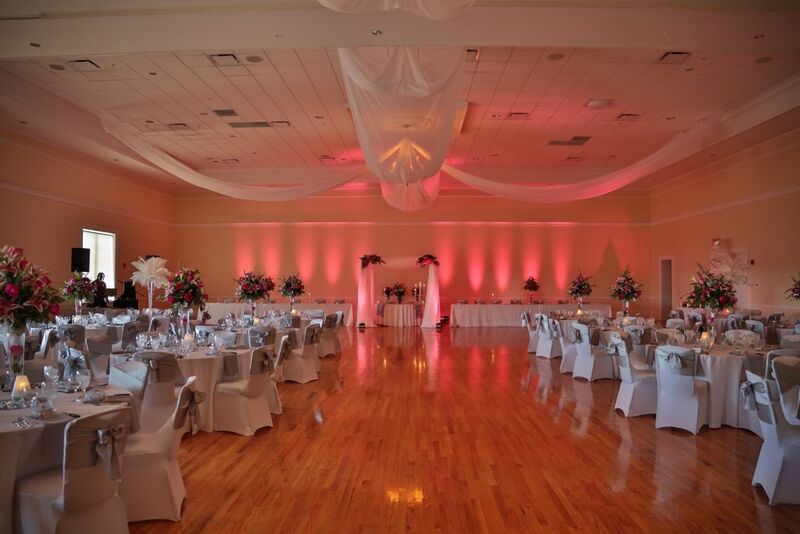 As you can see in the picture below left, our lights have a long throw distance to light up ceiling draping. 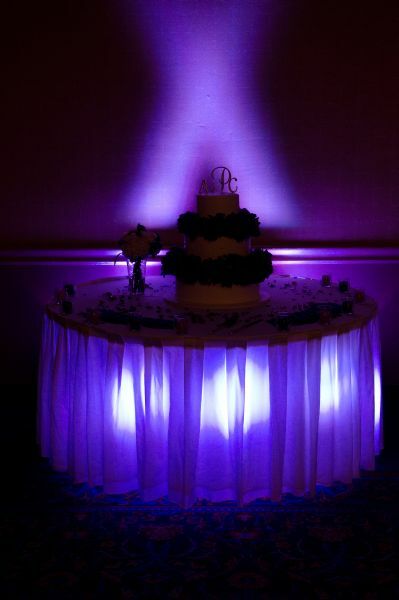 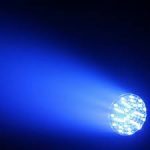 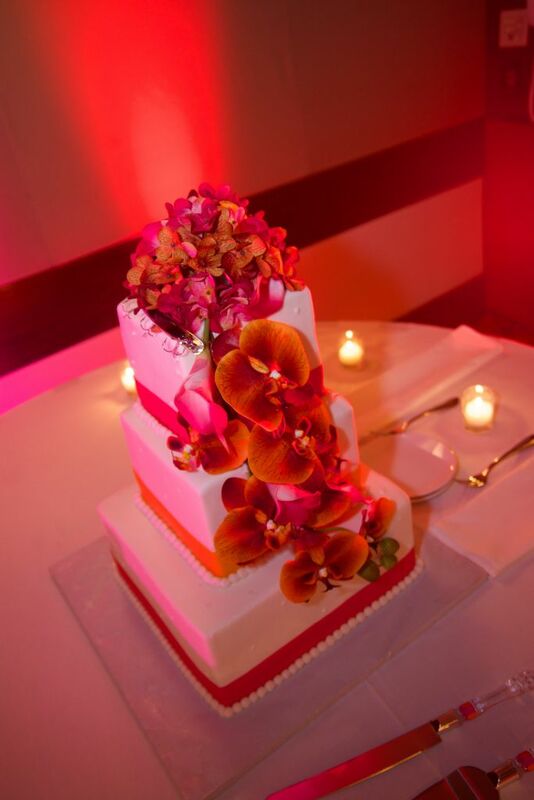 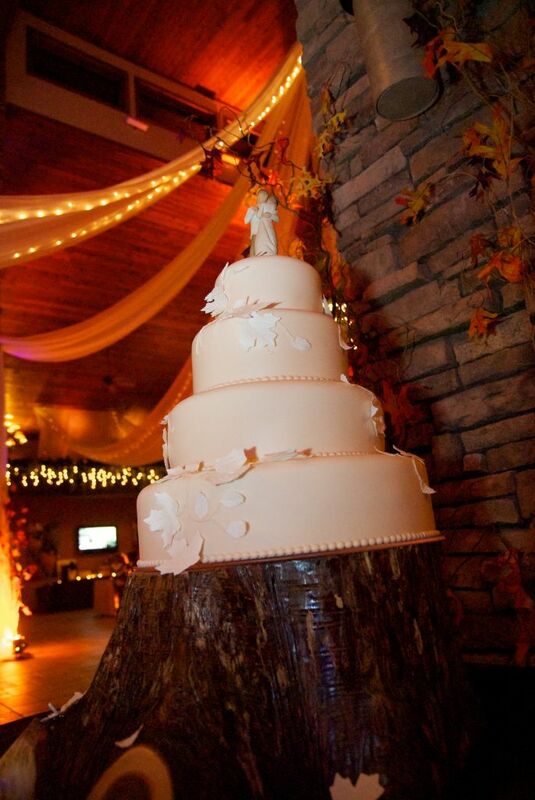 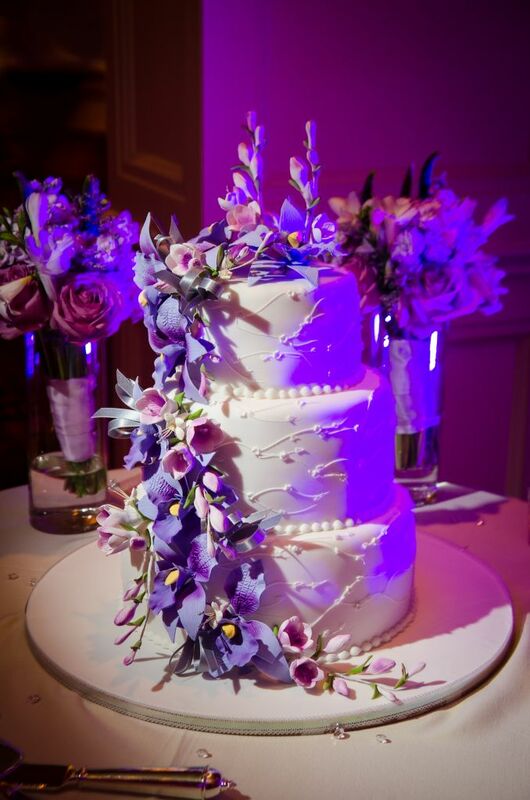 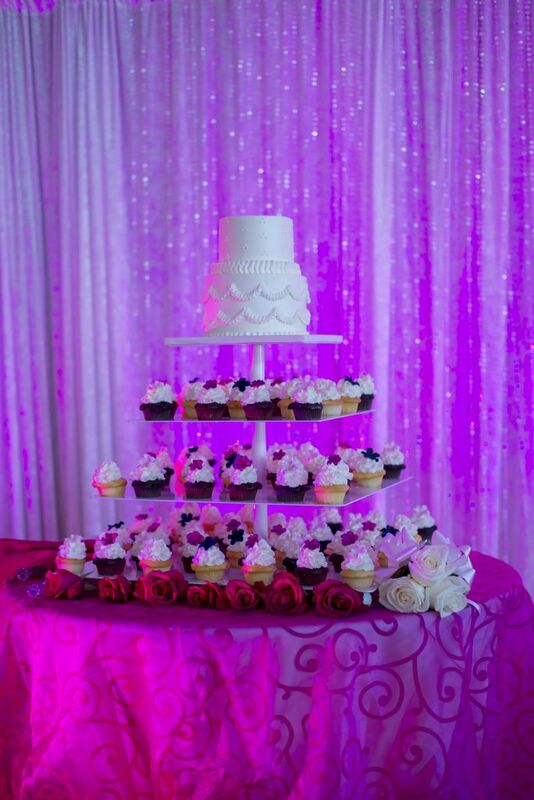 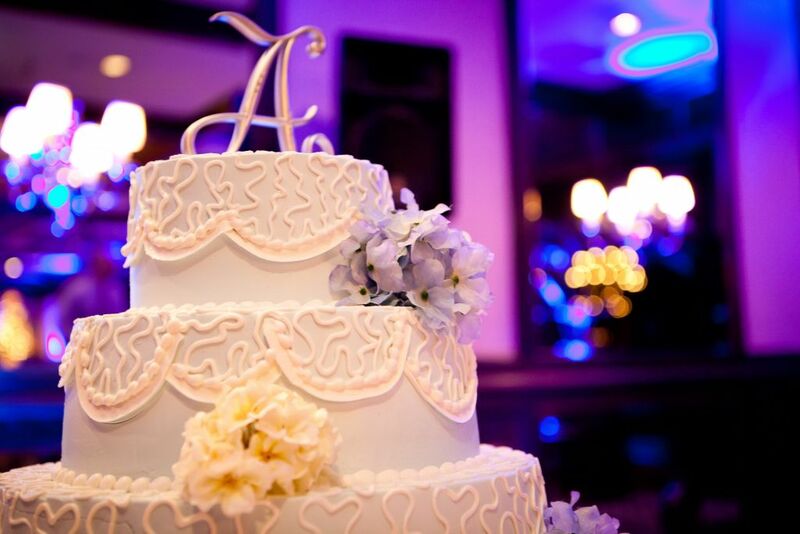 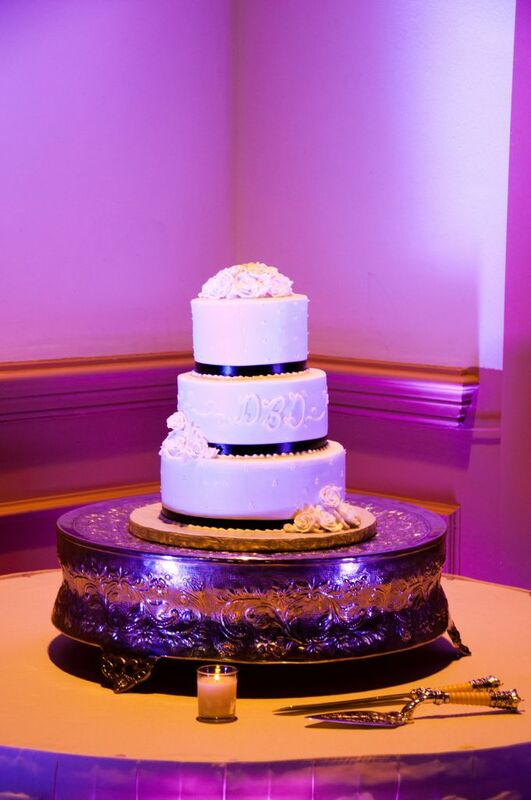 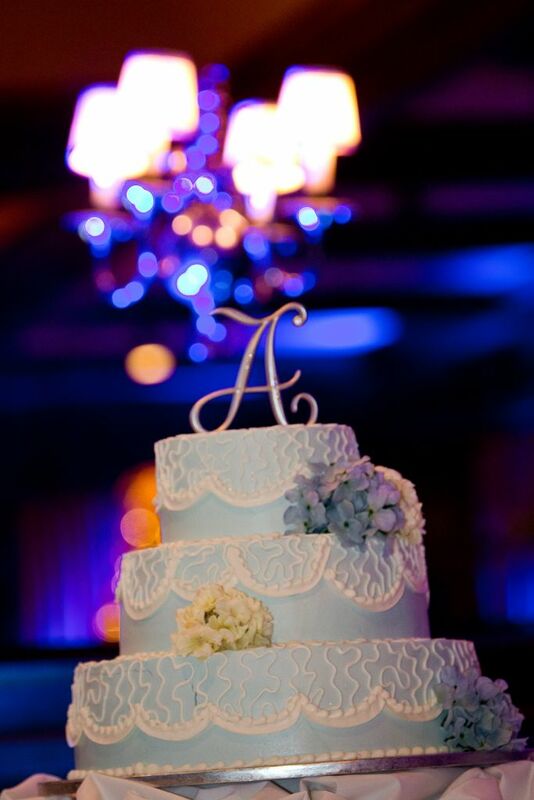 You have probably spent considerable amount of money and time in your wedding cake for it to be in a dark room, so why not highlight it with a projection spot light. 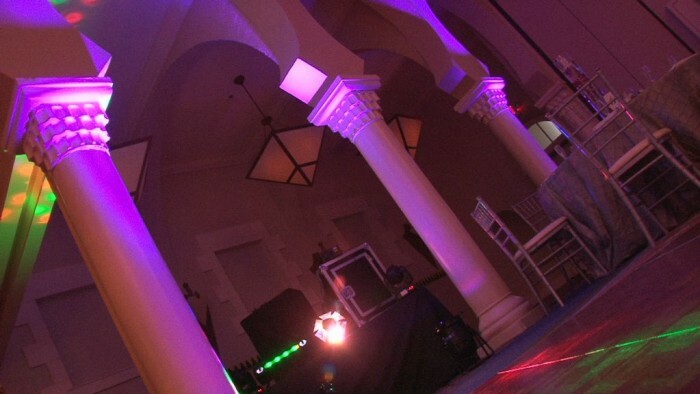 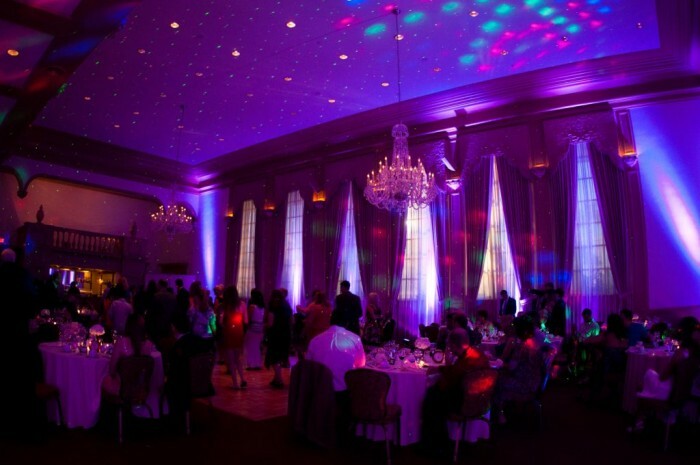 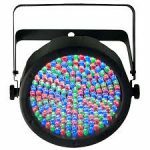 This light is mostly used for the dance floor however can also be projected on a wall or ceiling. This light creates a convincing underwater/water flowing effect softly transitioning through 5 rich colors. 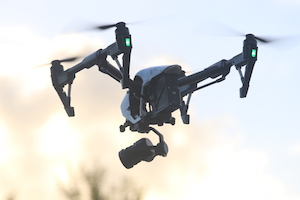 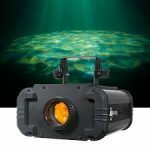 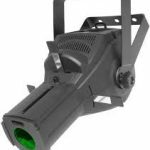 It has a powerful 80watt light that allows the effect to cut through fog and haze for added dimension.